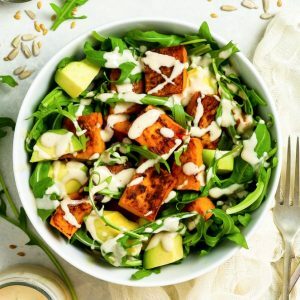 This sweet potato arugula salad is the perfect quick and healthy mid-week lunch, that you can prepare in just 15 minutes! 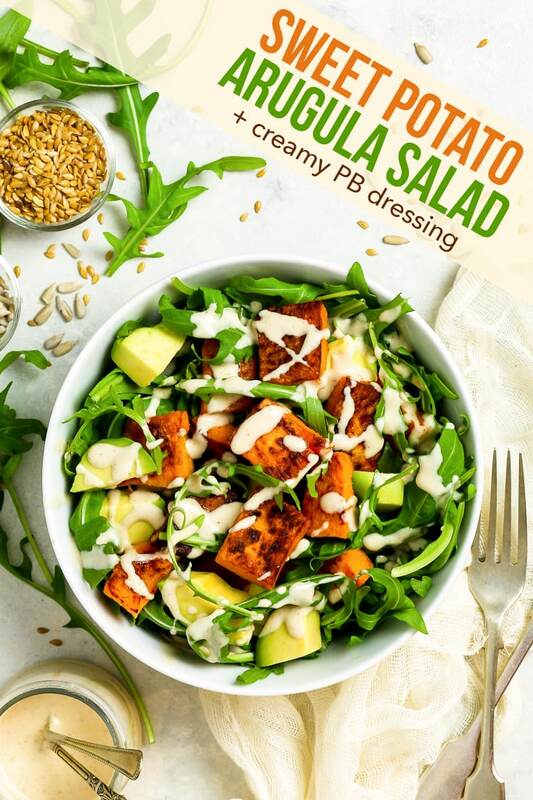 With a hack to make the most amazing “roasted” sweet potatoes (in only 10 minutes) and with the creamiest 4-ingredient peanut butter dressing, this gluten free + vegan arugula salad makes eating healthy the easiest thing in the world. Okay, so… hear me out. Brownies are awesome. 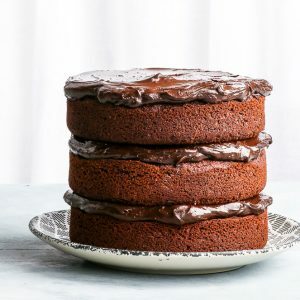 Making a kickass vegan cake is the best feeling ever. Marshmallow brownies are the stuff sweet, sweet dreams are made of. It’s all true. 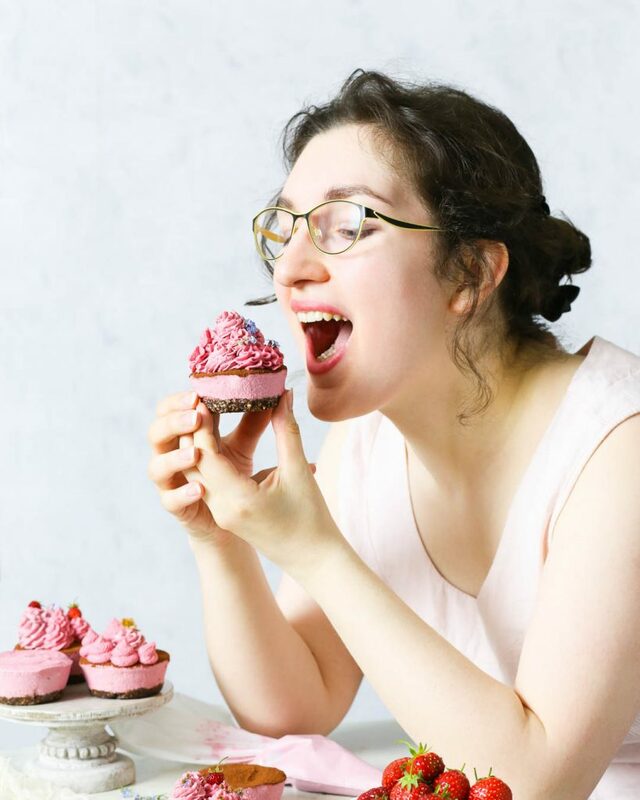 But, on a random Tuesday, when you’re still having flashbacks to allthesugar and allthebaking that happened over the weekend… the last thing you want to see is more brownies. Ugh. No. Plus, balance. The word is thrown around like confetti nowadays. But with all the running around and the stressing out and the (attempted) adulting, balance sounds just about perfect. Therefore: salad. A fun, delicious, nourishing 15-minute sweet potato arugula salad that’s so good I want to live in that salad bowl. And if you don’t think a salad can be quite that amazing: you’d be wrong. 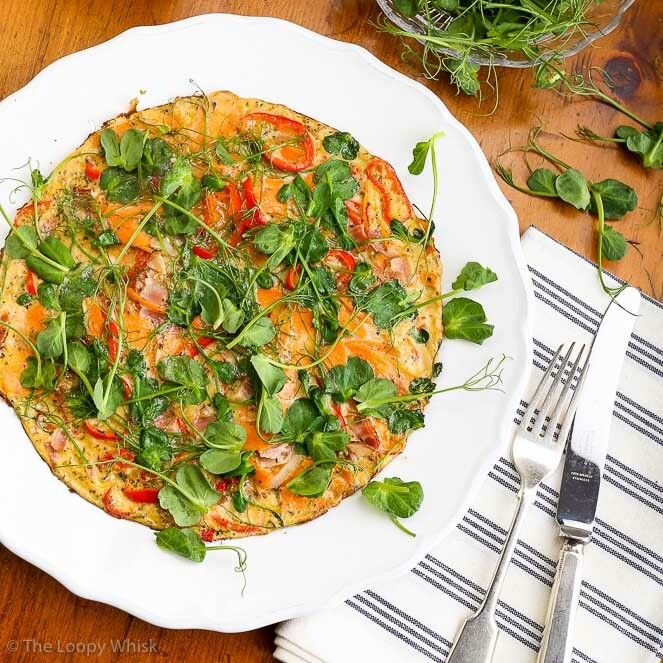 Nutty and slightly spicy arugula (a.k.a. rucola, a.k.a. rocket lettuce). 10-minute “roasted” sweet potatoes (yes, there’s a trick… it’s amazing #humblebrag). The most amazing creamy 4-ingredient peanut butter dressing. Microwave the sweet potato chunks until they’re perfectly soft (about 8 minutes give or take), and then pan fry them in some good ol’ coconut oil. The result are the most amazing sweet potatoes: soft and fluffy on the inside, caramelised on the outside, with a few crispy bits thrown in. And all of that in just 10 minutes! The 4-ingredient peanut butter dressing is another revelation. 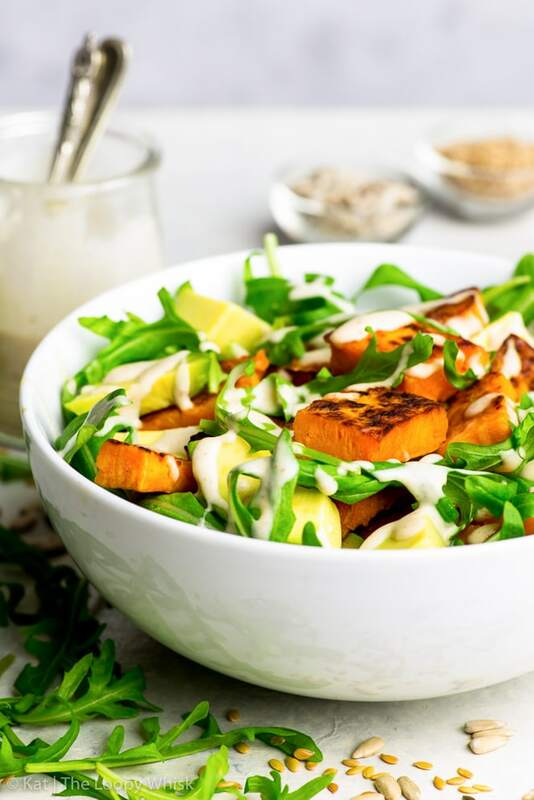 Creamy and decadent and nutty, it goes perfectly with this sweet potato arugula salad. And the four ingredients are just peanut butter, hot water, lemon juice and salt. That’s right: two of those four ingredients are salt and water. Just check out that drizzle. Da-yum! 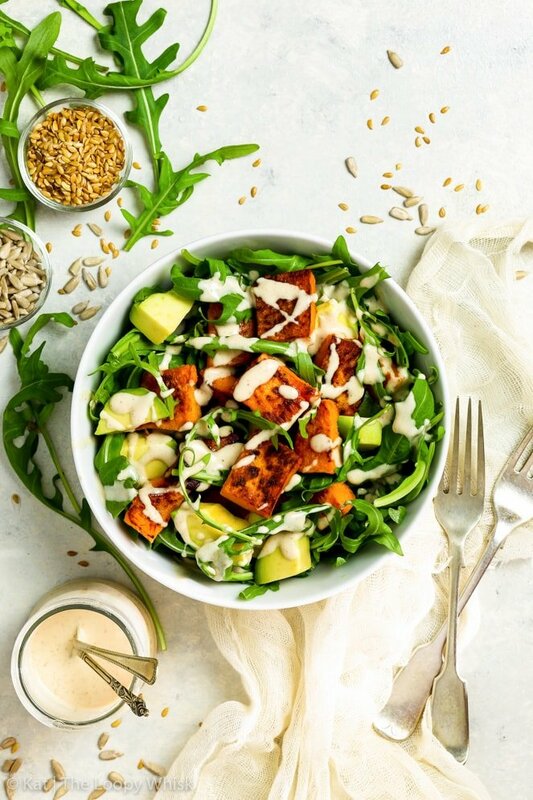 And don’t get me started on how ridiculously HEALTHY this sweet potato arugula salad is, with the healthy fats from the avocados and peanut butter, the fibre from the arugula and sweet potato, and the vitamins + minerals… in pretty much every part of this salad. Best of all: it tastes like an absolute feast. 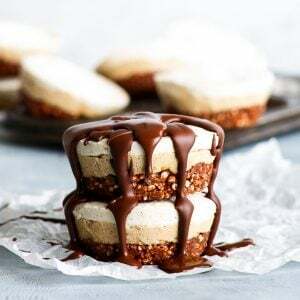 Like an indulgence. And all of this… in 15 minutes. 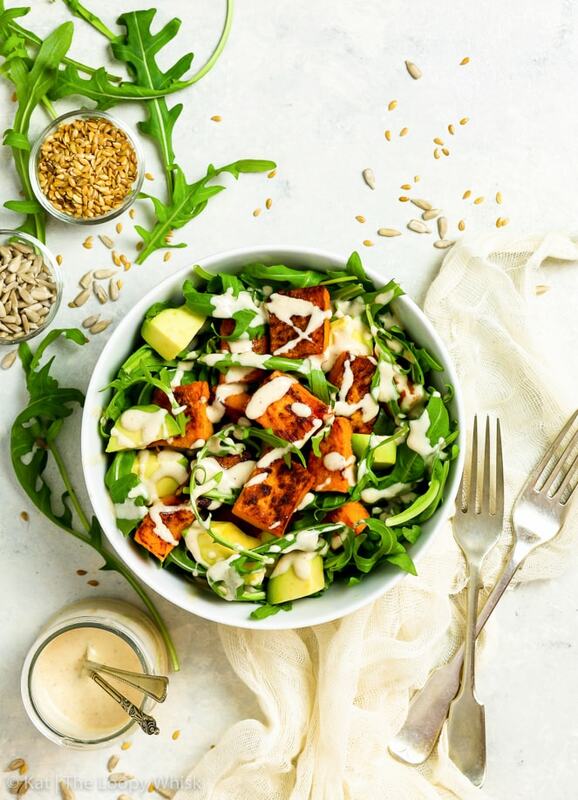 This delicious, healthy sweet potato arugula salad, that makes you feel like you’re doing something right, that you’re a pro at this adulting thing, and that balance is your middle name. Not bad for a random Tuesday salad. Not bad at all. 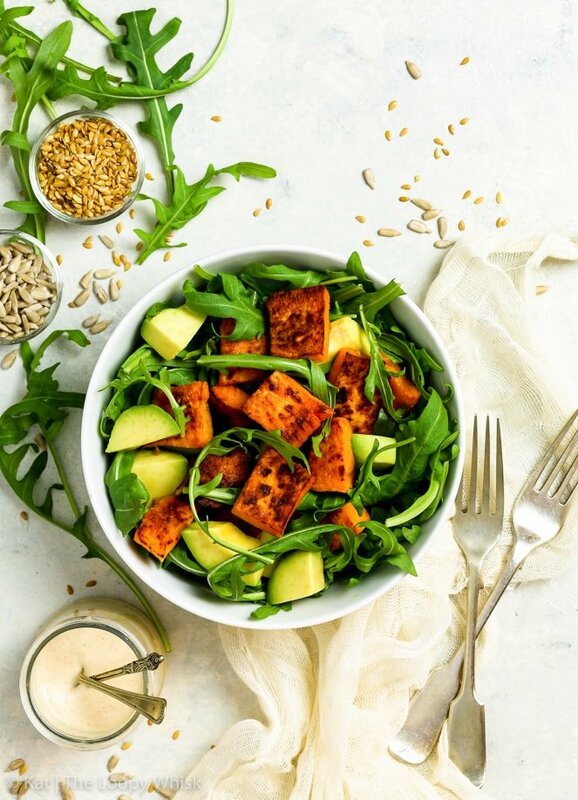 This sweet potato & arugula salad is the perfect quick and healthy mid-week lunch, that you can prepare in just 15 minutes! 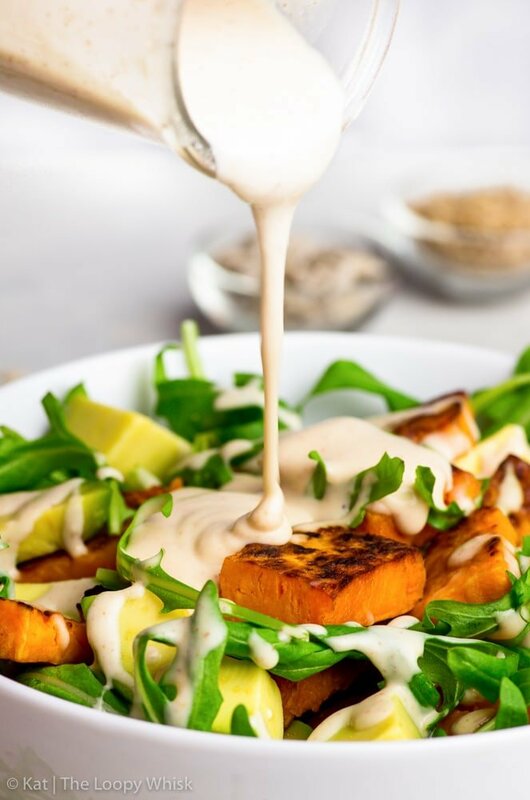 With a hack to make the most amazing “roasted” sweet potatoes (in only 10 minutes) and with the creamiest 4-ingredient peanut butter dressing, this gluten free + vegan arugula salad makes eating healthy the easiest thing in the world. Wash the sweet potato thoroughly and slice it into ~1/2 inch (~1 - 1.5 cm) thick slices. 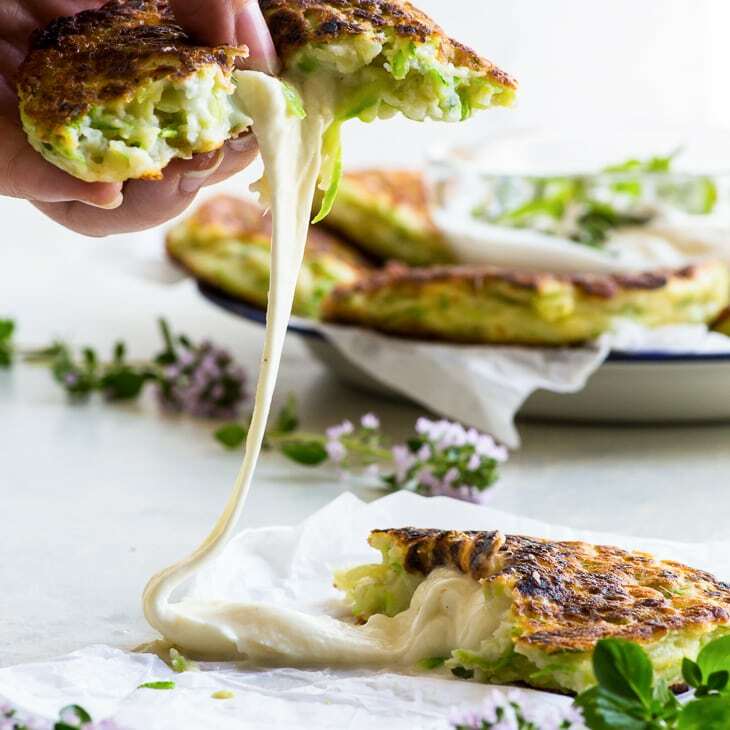 Wrap each slice individually into a damp kitchen towel. 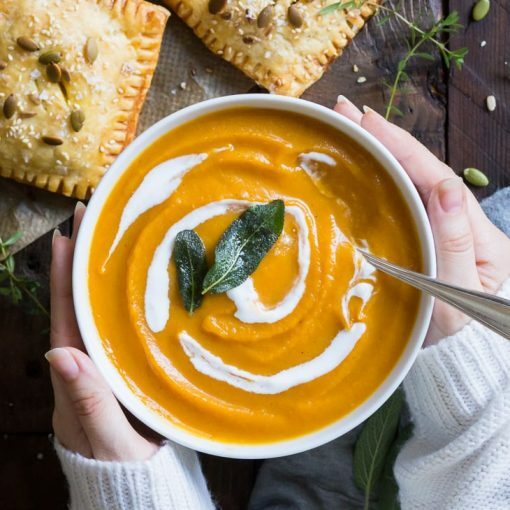 Place the wrapped sweet potato slices onto a microwave-safe plate, and microwave them on the highest setting for about 4 minutes. Flip the slices and microwave for a further 4 minutes. Check whether the sweet potato slices are cooked, and if they're not, microwave them in 15 - 30 second intervals until they're perfectly soft. To check if the sweet potato slices are cooked, try to insert a sharp knife – it should just pass straight through. 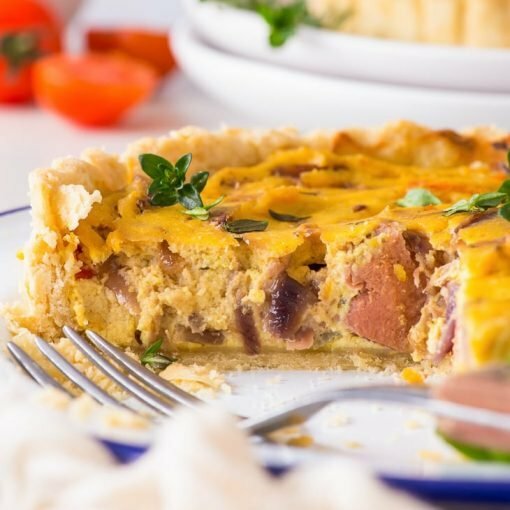 Once cooked, remove the sweet potato skin and cut the slices into chunks. Heat a pan until very hot, add the coconut oil and toss in the sweet potato chunks. Allow the chunks to caramelise by leaving them on one side for 30 seconds to 1 minute, then flip them over and fry them on the other side for another 30 seconds to 1 minute. 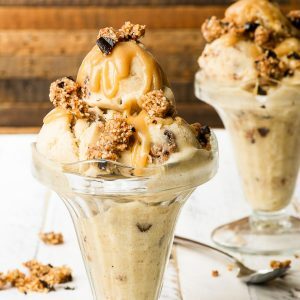 In a small bowl, mix together the peanut butter and hot water until fully combined - the mixture should be super creamy and almost fluffy in texture. Add the lemon juice and season with salt to taste. 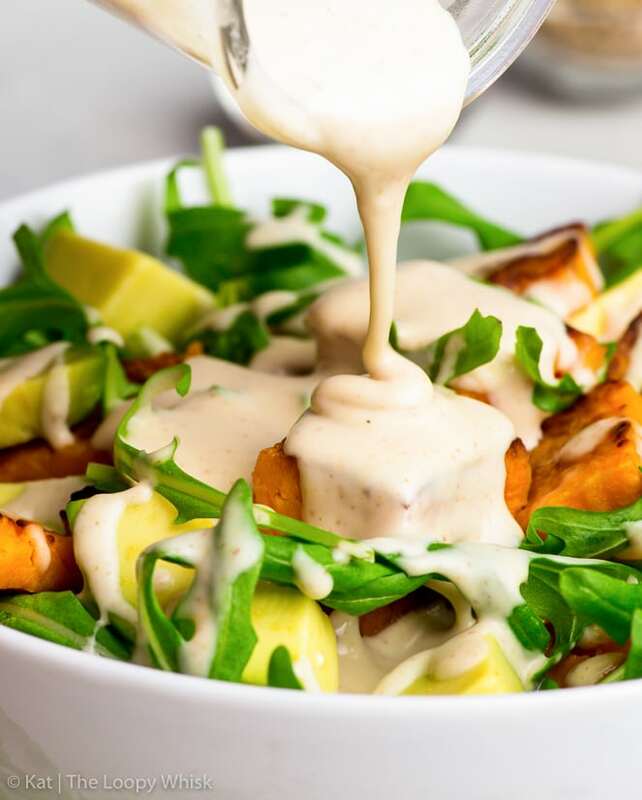 Place the arugula, sliced avocados and "roasted" sweet potatoes into a bowl and drizzle with the peanut butter dressing. Looking for the perfect HEALTHY dessert to go with this healthy salad? I’ve got you covered!